"Maybe we should have made it look like a traditional Windows PC," lamented Low End Mac's Dan Knight. Lesson learned the hard way. Following are news reports from CNN and the Associated Press about yesterdays events in Redmond, the home of Microsoft. CNN: A guerilla marketing exercise for Low End Mac has caused multiple security alerts in Redmond, Washington, where the company's new mascot was mistaken for a bomb. The bizarre debacle started after a marketing firm working for Cobweb Publishing, the parent company of Low End Mac, put up electronic light displays depicting LEMMY, a character greeting Redmond citizens and visitors with a wave. The light boards, which have been in plain site for the past two weeks, were somehow misinterpreted as suspicious devices. The city swung into a full security alert. Local, state, and federal law enforcement agencies shut bridges and sections of the Sammamish River - and CNN reported early on Thursday morning that US Northern Command was monitoring the situation from its Colorado Springs headquarters. Two men involved in planning and executing the stunt have been arrested, the Washington attorney general Rob McKenna has confirmed. The charges they face include a felony - placing a hoax device that caused panic - and a separate count of disorderly conduct. It remains a mystery as to why a full security alert was called on Wednesday over advertising devices that had been present in Redmond - and other major US cities including Boston, Atlanta, Philadelphia, New York, and Los Angeles - for the past two weeks, although McKenna attributed it to the devices having a "very sinister appearance" and "wires". Cobweb Publishing spent most of Wednesday evening apologizing for the chaos in the form of a written statement. "We apologize to the citizens of Redmond that part of a marketing campaign was mistaken for a public danger," said Cobweb Publishing CEO Daniel Knight. "We appreciate the gravity of this situation and, like any responsible company would, are putting all necessary resources toward understanding the facts surrounding it as quickly as possible. "As soon as we realized that the unfamiliar waving Macintosh was being mistaken for something potentially dangerous, appropriate law enforcement officials were notified, and through Federal law enforcement channels, we identified the specific locations of the advertisements in all 10 cities in which they are posted. "We also directed the third-party marketing firm that posted the advertisements to take them down immediately. "We appreciate the commitment demonstrated by the Redmond police department and other law enforcement agencies, as well as the Washington Governor's Office, and deeply regret the hardships experienced as a result of this incident." AP: In hindsight, complimentary bags of 30-pin SIMMs would have worked better. But without the benefit of hindsight, if not a clue, the powers-that-be behind Low End Mac decided to promote the Cobweb Publishing website by deploying little blinking light boards in various outdoor locations across 10 major US cities. All went well until Wednesday morning in Redmond, when, as the Seattle Times reported, a commuter spotted one of the blinking light boards in a bus station. Soon, there were reports of other blinking light boards throughout the city, some near bridges and highways. All hell promptly broke loose. Traffic was stalled and nerves frayed as authorities scrambled to determine if the suspicious devices - 10 in all - were dangerous, incendiary devices. It didn't take long to see that the battery-powered boards, some with exposed wires, weren't bombs. And it didn't take long to see that the LEMMY promotion was a bomb. A big one. "We regret that they were mistakenly thought to pose any danger," said a statement from Cobweb Publishing, parent of Low End Mac. Cobweb fessed up to the unorthodox "billboards" Wednesday afternoon. It said the light boxes were part of "an outdoor marketing campaign" that had been undertaken in 10 cities: New York; Los Angeles; Chicago; San Francisco; Philadelphia; Atlanta; Seattle; Boston, Massachusetts; Austin, Texas, and, obviously, Redmond, Washington. Only the blinking light boards in Boston prompted a scare. But Cobweb wasn't taking anymore chances. It said it was contacting local and federal law enforcement, and divulging the "exact locations" of all of its LEMMY promos, in all of the cities. Knight's make-good actions weren't cutting it with authorities who'd just lived through a day suited for 24's Jack Bauer. "It is outrageous, in a post 9/11 world, that a company would use this type of marketing scheme," Redmond Mayor Rosemarie Ives said in a statement. Ives, as well as Washington Governor Christine Gregoire, broached the possibility of legal action against Cobweb Publishing. The Associated Press identified the brains behind the promotional misfire as the New York City-based firm, Interference Inc. That company's website was down Wednesday night; its CEO unavailable for comment, the wire service said. As Cobweb Publishing's Dan Knight explains, LEMMY is the new Low End Mac mascot and was designed on a Lite Brite. 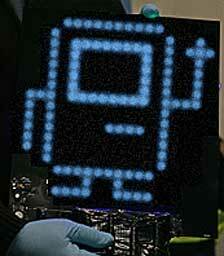 According to reports, LEMMY is the character depicted in the now-infamous blinking light boards.